On the July 23 episode of Tart And Tangy Triad Podcast, we decided to embark on a Weekend Cooking Challenge and recreate a recipe found by host, Stephanie Hess. The topic of conversation was all about the current trend of using craft beer as an ingredient for recipes. 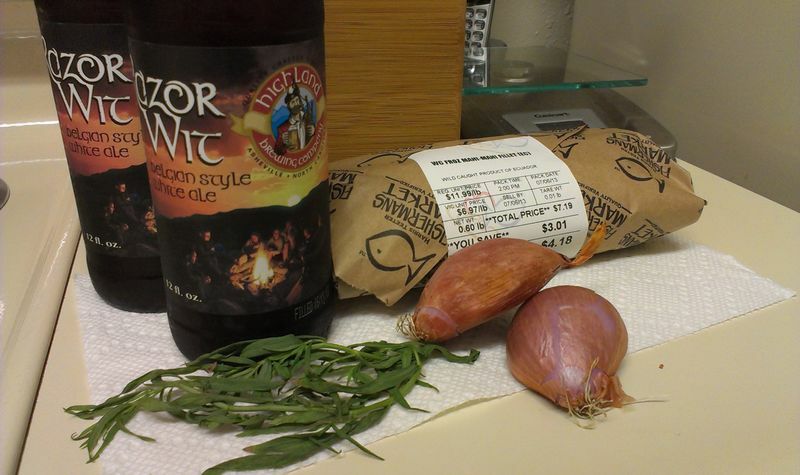 The article highlighting the use of craft beer was from Honest Cooking. Q: So what is craft beer and why should you use/drink it? A: Craft beer is produced by small, independent brewers. The beer is usually more flavorful and not mass-produced. This website has 10 reasons why you should drink craft beer. My reason: It's a great way support your local economy. And get drunk. 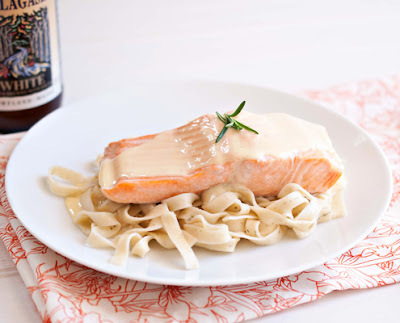 The original recipe used salmon. I used mahi. It's not that I don't like salmon, I just didn't think it was an appropriate fish for this recipe. Salmon is a very fatty fish. Salmon is usually paired with light, citrusy, vinegary sauces or salsas to cut the unctuous taste in your mouth. 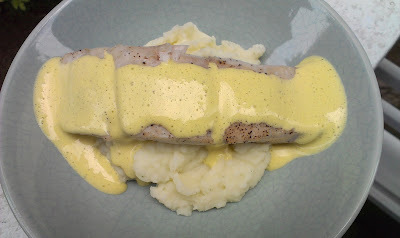 Béarnaise (basically hollandaise with shallots and tarragon in a red wine reduction) is not light. Yes, there is vinegar in this sauce, but egg yolks + butter = I need to go workout after I eat this. 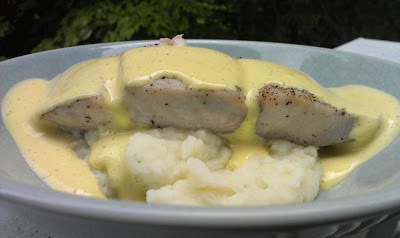 I also put the fish over mashed potatoes instead of noodles only because I did not like the photo on the website. I'm judgmental. Sorry. Place a wire rack over a rimmed baking sheet (or roasting pan). Pour one bottle of beer in the bottom of the baking sheet, making sure that the beer does not submerge the wire rack. You want at least 1/2 inch between the beer and the top of the wire rack. Use non-stick spray or oil to grease the rack so the fish does not stick. Salt and pepper the fish and place it on the greased wire rack. 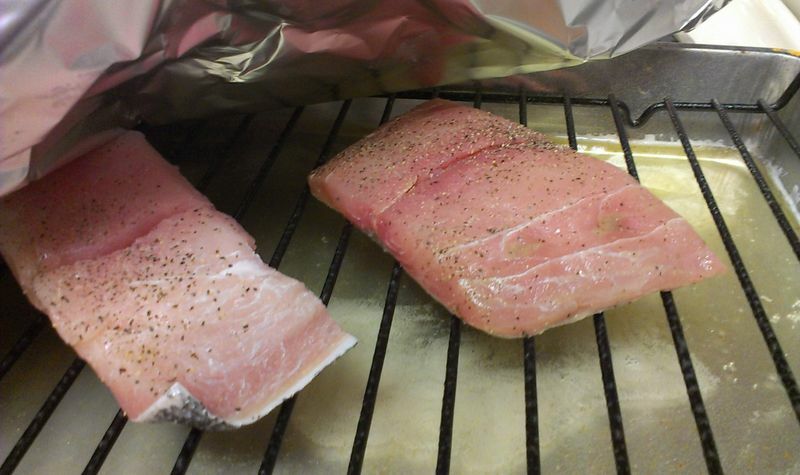 Mahi mahi fillets on the wire rack. Just chillin'. Cover the baking sheet with aluminum foil, making sure to tent the foil over the fish so that the foil does not touch the fish at all. Secure tightly, in order to trap the steam inside the foil. 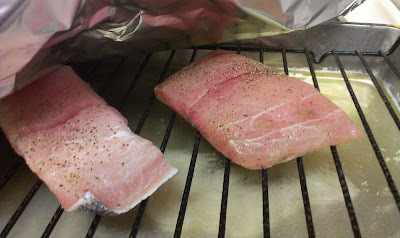 Bake for 15-18 minutes or until the fish flakes easily with a fork. While the fish is cooking, make the Béarnaise. Add 1 cup of the remaining beer, the vinegar, shallots, white pepper and tarragon to a small saucepan over medium-high heat. 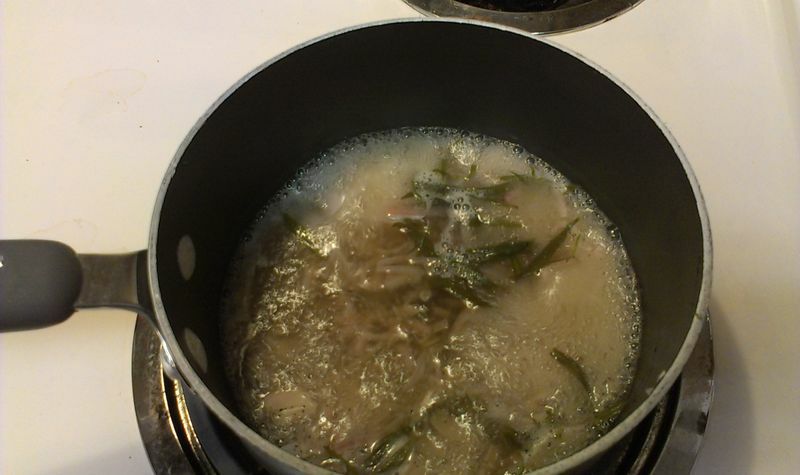 Allow to simmer and reduce until about 2 Tbs of liquid remain, about 8 minutes. While the beer mixture is reducing, melt the butter in a sauce pan (or the microwave) until very hot and just starting to bubble. Pour the reduced beer mixture through a fine mesh strainer, to remove the solids, into a food processor. Add egg yolks and salt to the mixture inside the food processor and turn it on for 10 seconds to blend the mixture. Next, remove the stopper from the top of the food processor lid and slowly pour the melted butter into the food processor while it is still running. Allow to process until well combined and frothy, about 2 minutes. Plate the fish over mashed potatoes, rice or pasta, pour about ¼ cup sauce over each piece of fish. I love to try my husbands craft beers every now and then but never thought to cook with them (not sure he'd let me either...might have to steal one ha ha) but I will give it a shot. I just bought him a draft beer tender for at home so I'll use that as a good reason why he should let me use some of the craft beer. Do you know if it's any good? He doesn't know he has it yet. I've seen this in people's homes and I've used it before, and I know it chills beer well. I can't say how easy it is to change the keg or clean it, but it works well!